Track Certification: Restricted - valid until 30th Jun 2004 (undersized HJ landing area, no provision for steeplechase, PV, SP). DT/HT cage and requires work to bring to spec. 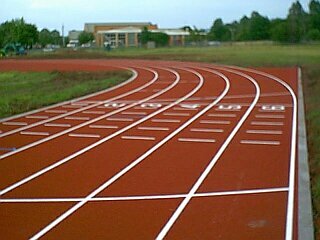 This track was completed in August 2001 as a new facility. The main contractor was Heydour Contract Services Ltd. The track surface is believed to be a product of Tarkett Sommer Sports Systems (probably Resisport) and was laid by Fox Sports Surfaces by the end of May 2001. The lane markings were completed by Athletic Markings Ltd. on 12th June 2001. The field facilities are limited with no provision for PV & SP. The school is a sports college and there is also a Sports Centre near the track.